The public transport system on the Big Island is called the “hele-on bus”. 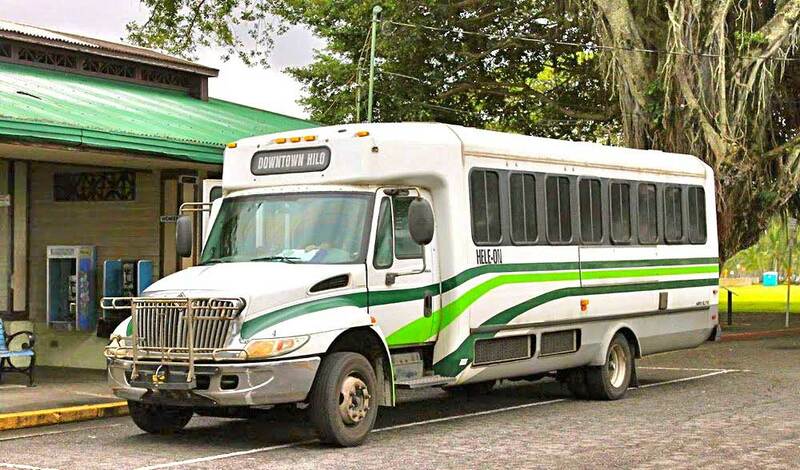 This bus can get you around the whole of the Big Island, and using it is cheap. However, the bus schedule is not optimized for sightseeing, and using the bus to get around the island can be time consuming. Note that the hele-on-bus is also jokingly known as the coldest place on the Big Island, with the air conditioning often blasting at full-power. Make sure to pack long sleeves if you go for a cross-island bus trip! How much does the Hele-on bus cost? The standard fee for the Hele-on bus is $2.00 (last checked: 2016 ) per ride, but there may be additional charges. If you are taking a big backpack or a suitcase onto the bus that does not fit under your seat you might be charged for another seat by the driver. You can also take a bicycle on the bus (actually, you put it on a rack in front of the bus), but this will also cost you an additional $2.00. The schedules of the bus system on the Big Island are not ideal for tourism. Rather they are made to make commuting to and from work for locals possible. This means that most routes are only served early in the day and after work. You can check the schedules and maps of the hele-on-bus here. It is possible to take the bus from the Hilo airport and the Kona airport. However, the bus has few scheduled stops at the airports and advance planning is needed if you choose to take the bus from (and to) the airport. You can find up-to-date information on the hele-on bus airport service on the hele-on website. the largest advantage of taking the bus is the price. The disadvantages are it’s range which is restricted to the more populated places, and the limited schedule. Taking a trip with the hele-on bus is sure to introduce you to a whole bunch of colorful local residents, and will add local flavor to your trip that few other tourists will taste. Summarizing, if you are in no hurry or have little money to spare the hele-on bus is a viable option for your transport. Be prepared though to walk a little, and pack something warm! In the Hilo area it is possible to use a flexible shared ride taxi program for as little as $2 per ride. Note that Travel is limited to 9 miles with the shared taxi ride program, which is pretty restrictive if you have tourism on your mind. Taxi coupons have to be ordered ahead by mail in quantities of 5 or 15 coupons, and a copy of your ID is required. See the shared taxi ride information page of Hawai’i county for more information. No shared ride taxi service is available in Kona at the moment. When in need of such transport, please use the normal (more expensive) taxi services in Kona and surroundings.